Brandywine Zoo: Small but Mighty! Delaware's Brandywine Zoo is nearly 110 years old and has a remarkable pedigree as one of our nation's first zoos. It was designed by Fredrick Law Olmstead, who, notably, also designed New York City's Central Park. While not a big zoo, the animal care staff, with smiles on their faces, confidently assured me that, while small, they are mighty. At least one of the reasons for the keepers' confidence was their collective achievement in the San Diego Zoo Global Academy: 15 animal care staff recently completed all 13 "Fundamentals" online classes. The Animal Care Training (ACT) professional series of classes was conceived to create relevant content, feature best practices, and provide a progressive career development ladder for animal care staff. The "Fundamentals" classes comprise the first third of the professional development series; the entire series comprises 3 groups of 13 classes each, for a total of 39 classes in all. The "Intermediate" classes (in production now, 2015/2016) focus on subjects of importance to animal care supervisors and area leads. The "Advanced" classes (coming in 2017-2018) will focus on a variety of topics particularly important to animal care managers and curators. This online professional development series is the first of its kind in the world's zoo and aquarium industry. Brandywine Zoo Director Gene Peacock shared with us that, "Partnering with San Diego Zoo Global for this training was a no-brainer. The online training is available to my staff 24/7, it is affordable, the courses are high quality and feature best practices, and we now have our very own, 'Brandywine Zoo branded' training site for our employees." Mark Haddad is an intern at Brandywine and is in the early stages of his career in animal management. Haddad immediately recognized the opportunity presented by the Brandywine Zoo's new online training platform. In addition to the professional development series, the Academy boasts a vast catalogue of online courses and recorded webinars featuring a wide variety of relevant subjects. Haddad noted, "I am so fortunate to be in the right place at the right time. Because I am an intern at Brandywine, these online courses were free to me. I enjoyed the Academy's platform and learned so much interesting and useful information about the management and care of exotic animals!" 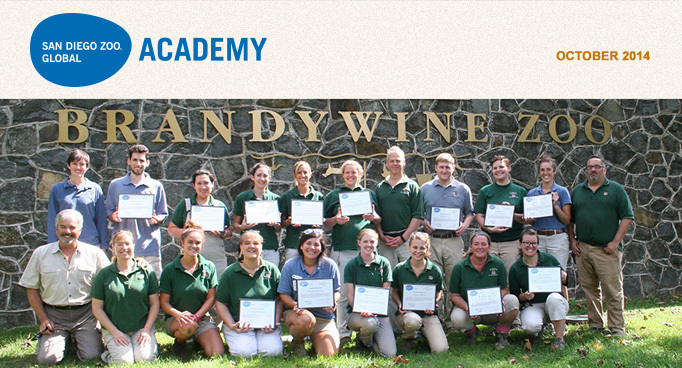 The San Diego Zoo Global Academy salutes the staff of Delaware's Brandywine Zoo for their accomplishments. As a group, these folks recognized a great training opportunity when their zoo director presented it to them. As a strategic priority for building staff competencies, the Zoo's leadership didn't have to ask twice. The staff actually began to compete with each other for completing all 13 classes. Small but mighty, indeed! The Academy Has Added a New Leadership Course! We are pleased to announce the addition of a new leadership course to the San Diego Zoo Global Academy learning catalog. This course is part of a series of courses we will be releasing throughout the year on leadership and management. The "Leadership and Innovation" course teaches the difference between managers and leaders, and describes how effective organizational communication relies on the skills of employees, managers, and leaders alike. It introduces several theories of management, leadership, and motivation to help employees become effective communicators and, therefore, effective leaders. Dr. Rob Jones' first webinar on "Gills, the Powerhouse of Fish" was very well received. Jack Schneider, curator of fish and invertebrates at Mystic Aquarium shared with us that, "...16 of our staff enjoyed and learned from Dr. Jones' presentation. It was just the right level of technical detail for the format and post-lunch time (here on the East Coast). We are looking forward to participating in his next presentation in November." In this next webinar, Dr. Rob Jones, an aquatics animal veterinarian who specializes in the care of both freshwater and marine animals, will take a close look at the "Nitrogen Cycle and Biofiltration." He will review one of the most common causes for the death of fish: ammonia toxicity, and to a lesser extent nitrite toxicity. Understanding the nitrogen cycle is essential for any type of fish keeping. The webinar will look at the steps in the conversion of ammonia to nitrite and then to nitrate, as well as the toxicity of the various stages in the cycle. Bio-filtration is one of the most critical components of any closed system. What a bio-filter is and how to establish and successfully maintain one will be discussed. An examination of the process of denitrification will complete the webinar. CypherWorx, San Diego Zoo Global Academy partner, will be presenting an Administrators Users Group meeting. This is an opportunity for administrators of custom sites to discuss resources, share ideas, and ask questions. If you are interested, please join us! The meeting will include a review of the "System Requirements," the CypherWorx Support Hub, the DIY option, and site maintenance tips. We are pleased to share that the San Diego Zoo Global Academy won a Brandon Hall Group award for excellence in the Certification category. This accomplishment is shared with our collaborative partners: thank you! The Virginia Aquarium has joined the Academy's collaborative learning environment. Now they will have two privately branded customized sites, one for their employees and one for their volunteers. Welcome! Thank You to AZA for a Great Annual Conference in Orlando! From Lisa Tate, Director: The Red River Zoo in Fargo, North Dakota strives for excellence. We are an award-winning institution known for our conservation work with cold-climate species, and we are committed to employee knowledge, satisfaction, and growth. It is important for us to have employees who understand and implement best practices in all aspects of our work. With an operations budget of less than one million dollars, we are a smaller institution with limited resources. 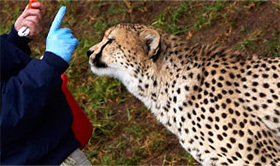 San Diego Global Academy has made it possible for the Red River Zoo to offer our staff top-notch instruction in all facets of our zoo's operations. From animal husbandry to nonprofit development to understanding regulatory standards and accreditation requirements, San Diego Zoo Global Academy has so many options. There is truly something for everyone on our staff. The Red River Zoo ties incentives and bonuses to course certifications, which allows employees to take advantage of the classes at their own pace. Our staff and our organization have truly benefited from this service. I highly recommend it to any organization that strives for excellence. Looking for a place to add all of your new employee onboarding documents? Go to the "Administration" tab on your My Academy website and click on "Resources Admin," go to the top right corner, and click on "Module Settings." From there, you can add as many categories as you would like. At San Diego Zoo Global, we created two categories: New Employee Onboarding & New Supervisor/Manager Onboarding. The goal is to keep adding updated content and reminding employees that these categories are there for reference and learning. There are many training pieces already available within the Academy that may save you a lot of time. For example, the "An Introduction to Working with Volunteers" webinar can be required viewing for anyone at your facility who utilizes volunteer services and/or before you fulfill any volunteer requests from other departments. The training materials from the webinar are also available so you can modify them for your specific needs if you prefer to do the training yourself. Check it out! At San Diego Zoo Global, we are currently reviewing our Job Hazard Analysis documents and updating those that need it. As a significant part of this process, it is very important to have the tools to properly train our employees who perform high-risk tasks. The extensive safety catalog in the Academy enables us to provide training for many of these tasks that we perform at our sites. Our training toolbox is now pretty full. In our industry though, there are plenty of tasks where there is no safety training available. I will identify those tasks and work with subject matter experts to create DIY (Do It Yourself) courses in order to address those specific needs.